Background: Various modalities of treatment have been used in the treatment of acne and nowadays, clinicians seek to employ new technologies in acne care like chemical peeling. Objectives: The objective of this study is to compare the efficacy of salicylic acid and mandelic acid peel in the treatment of mild to moderately severe acne vulgaris. Methodology: A total of fifty patients with mild to moderately severe acne graded based on Global Acne Grading System were divided randomly into two groups of 25 patients each. Group A patients were treated with 20% salicylic acid and Group B patients were treated with 30% mandelic acid every 15 days for six sessions. Pre- and post-peel sunscreen and moisturizer were prescribed. Percentage of improvement in inflammatory and noninflammatory lesions at the end of six sessions was the primary endpoint measure. The improvement was graded as mild, moderate, good, and significant. Results: All the patients showed improvement of acne at the end of the treatment. The mean improvement of inflammatory acne in Group A was 73.3% and in Group B was 65.4%. The mean improvement of noninflammatory acne in Group A was 39.4%, and Group B was 27.9%. In both groups, the improvement in both inflammatory and noninflammatory lesions was found to be statistically significant (P < 0.05). Conclusion: Salicylic acid peel was found to be more efficacious than mandelic acid peel. However, the side effects were less common with no postinflammatory hyperpigmentation with mandelic acid peel. There are various chemical peels that have been used effectively in the treatment of acne vulgaris such as glycolic acid, lactic acid, and salicylic acid. To the best of our knowledge, up till date, there has been paucity of published data regarding mandelic acid alone being used in the treatment of acne. This might be because of the large structure, which causes slow penetration, thus making it difficult to evaluate as a peeling agent. Salicylic acid being one of the effective chemical peel in treatment of acne, it is worthwhile to compare the efficacy of mandelic acid with salicylic acid peel in patients with acne vulgaris. 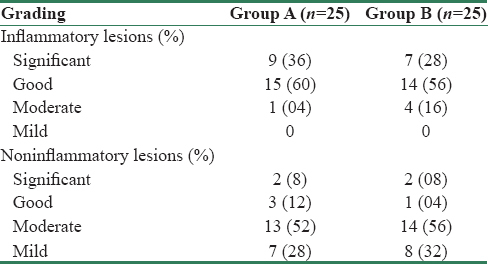 A randomized single blind active-controlled study was conducted during January 2014 to June 2015 on fifty patients with acne vulgaris attending the Outpatient Department of Dermatology of a Tertiary Care Teaching Hospital. The inclusion criteria included patients of either gender aged between 15 and 40 years with mild to moderately severe acne vulgaris involving only the face. Both new and already treated patients who have stopped therapy for 15 days were included in the study. The pregnant and lactating women, patients with a history of herpes simplex infection, hypertension, diabetes, thyroid disorders, or keloidal tendencies and those on drugs causing acneiform eruption were excluded from the study. All the patients were informed about the nature of the study, and written consent was obtained before including them in the study. The demographic details such as age, gender, and occupation were taken. Details of the symptoms, duration, site, and type of lesions and Fitzpatrick skin type  were recorded. Acne vulgaris was classified by Global Acne Grading System. Each location was given multiplication factor, ×1 for nose and chin, ×2 for face, right cheek and left cheek, and ×3 for chest and upper back. Each type of lesions was graded 0-4, 0 for no lesions, 1 for comedones, 2 for papules, 3 for pustules, and 4 for nodules. The score for each area (local score) was calculated using the formula - local score = (factor) × (grade 0-4). The global score was calculated adding local scores and acne severity was graded using the global score. A score of 1-18 was graded as mild acne, 19-30 as moderate acne, 31-38 as severe acne, and >39 as very severe acne. 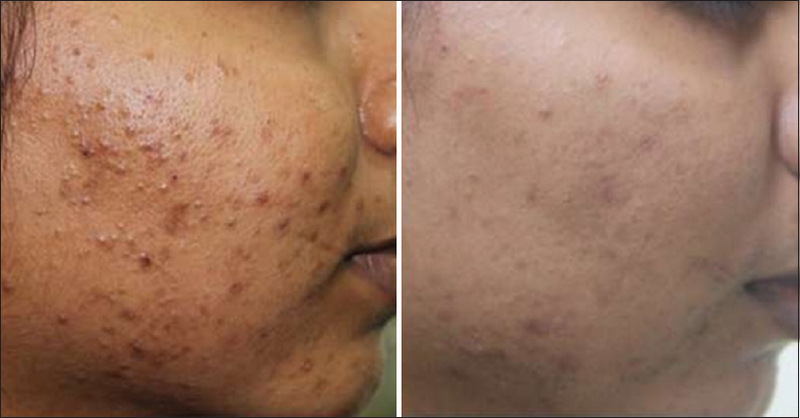 Clinical photographs were taken and grading of acne done before the commencement of therapy and after 2 weeks of completion of therapy. The patients, who fulfilled the inclusion criteria, were divided randomly using lottery method into two groups of 25 patients each. The patients were advised to avoid cosmetics and were started on priming with retinoic acid at night for 2 weeks. In Group A, 20% salicylic acid and in Group B, 30% mandelic acid peel was done every 15 days for six sessions according to the standard guidelines prescribed for chemical peel. Salicylic acid peel was used as an active control as it has been considered as effective treatment in acne vulgaris. Pre- and post-peel sunscreen and moisturizer were prescribed. Percentage of improvement in inflammatory and noninflammatory lesions at the end of six sessions was the primary endpoint measure. The improvement was graded based as percentage decrease in lesions, <25% as mild, 25%-50% as moderate, 51%-75% as good, and >75% as significant improvement. The assessment for all the patients was done by the same investigator and was kept blind about the treatment received by the patients. Statistical analysis was done using paired Student's t-test and Chi-square test. P < 0.05 was considered as statistical significance. The mean age in Group A was 22.1 ± 2.2 years, and in Group B, it was 21.2 ± 2.6 years. In Group A, 16 (64%) patients were females and 9 (36%) patients were males. In Group B, 14 (56%) patients were females and 11 (44%) patients were males. The majority of the patients in both groups had a duration of acne between 1 and 6 years (Group A - 88% and Group B - 80%). The most common Fitzpatrick's skin type in both groups was type IV (Group A - 44% and Group B - 60%). In Group A, score of inflammatory acne reduced from 26.2 to 7 after six sessions, i.e., there was 73.3% improvement. Score of noninflammatory acne reduced from 7.1 to 4.3, i.e., there was 39.4% improvement. Overall, there was 66.1% improvement [Figure 1]. In Group B, the score of inflammatory acne reduced from 23.7 to 8.2 after six sessions, i.e., there was 65.4% improvement. The score of noninflammatory acne reduced from 6.8 to 4.9, i.e., there was 27.9% improvement. Overall, there was 57.04% improvement [Figure 2]. In both groups, the improvement in both inflammatory and noninflammatory lesions [Table 1] was found to be statistically significant (P < 0.05). Salicylic acid peel appears to be more efficacious than mandelic acid peel in treating inflammatory acne, however, the difference was not significant statistically (P > 0.05). In treating noninflammatory acne, salicylic acid peel was more efficacious than mandelic acid peel and the difference was statistically significant (P < 0.05) [Table 1] and [Table 2]. Overall, salicylic acid peel appears to be more efficacious than mandelic acid peel in treating mild to moderate acne. However, the difference is not significant statistically (P > 0.05), implying that the efficacy of mandelic acid peel is statistically comparable to salicylic acid peeling the treatment of acne vulgaris [Table 1]. In Group A, the most common side effect noted was post peel erythema in 12 (48%) patients, which subsided in few hours, burning and irritation in 9 (36%) patients, visible skin peeling in 5 (20%) patients, and postinflammatory hyperpigmentation in 2 (8%) patients, which resolved completely with use of skin lightening creams over a period of 3 months [Figure 3]. In Group B, the most common side effect noted was postpeel erythema in 7 (28%) patients, and burning and irritation in 5 (20%) patients, both of which subsided within 6-8 h of the procedure. None of the patients had any visible peeling or postinflammatory hyperpigmentation. Acne vulgaris, the "Stigma of Adolescence" exceeds all other causes of suffering in adolescent age group. Many patients do not seek medical advice. Only a few, cosmetically conscious adolescents, come for the treatment, irrespective of the severity of acne. Acne therapy is aimed at correcting the abnormal infundibular hyper-proliferation, reduction of sebum production, reducing the colony of Propionibacterium acnes and preventing the release of inflammatory mediators responsible for the pathogenesis of acne. The improvement in the present study was less compared to the study done by Sayed and Abdel-Motaleb  who treated mild and moderate acne patients with salicylic acid peel and found that there was 70%-85% improvement in acne. Bae et al. treated 13 patients with facial acne with salicylic acid peel for three sessions, 2 weeks apart and concluded that salicylic acid is effective in both inflammatory and noninflammatory acne lesions, similar to the findings noted in the present study. According to Taylor,  chemical peeling with mandelic acid, when compared with glycolic acid peel, produced less erythema and was less likely to result in crusting and blistering side effects. Acne improved remarkably in many patients treated for inflammatory pustular, papular, and comedonal acne. Many acne patients who were resistant to both systemic and topical antibiotics have responded very well to mandelic acid. The adverse effects to salicylic acid peel in the present study are similar to that of Sayed and Abdel-Motaleb  and Bari et al. A study conducted by Bari et al. on tolerance and safety of salicylic acid peeling in various dermatoses suggested that salicylic acid superficial peeling was well tolerated in skin types III to VI and was reasonably safe procedure for treatment of acne. Mandelic acid peel was well tolerated with lesser side effects. Kessler et al. compared 30% glycolic acid and 30% salicylic acid peels in the treatment of mild to moderately severe acne, where salicylic acid peels demonstrated a significant decrease in acne lesions post treatment similar to the present study. Sayed and Abdel-Motaleb  compared salicylic acid and lactic acid chemical peel in mild and moderate acne, where both the agents were effective in treating acne. However, the improvement was more favorable with salicylic acid peel. Garg et al. compared 35% glycolic acid and the combination of 20% salicylic acid - 10% mandelic acid peel in active acne, postacne scarring, and hyperpigmentation. They found that salicylic-mandelic combination peel was significantly better than glycolic acid peel in treatment of acne because of the unique lipophilic and anti-inflammatory properties of both salicylic and mandelic acid. There has been paucity of published data regarding mandelic acid alone being used in treatment of acne. This might be because of the large structure of mandelic acid, which causes slow penetration, thus making it difficult to evaluate as a peeling agent. Although salicylic acid peels were more effective than mandelic acid peels in treating both inflammatory and noninflammatory acne; the side effects were relatively higher with salicylic acid peel. Layton AM. Disorders of sebaceous glands. In: Burns T, Breathnach S, Cox N, Griffith C, editors. Rook's Textbook of Dermatology. 8 th ed. Oxford: Blackwell Publishers; 2010. p. 42.1-42.49. Thomas DR. Psychosocial effects of acne. J Cutan Med Surg 2004;8 Suppl 4:3-5. Al Robaee AA. Assessment of general health and quality of life in patients with acne using a validated generic questionnaire. Acta Dermatovenerol Alp Pannonica Adriat 2009;18:157-64. Kim RH, Armstrong AW. Current state of acne treatment: Highlighting lasers, photodynamic therapy, and chemical peels. Dermatol Online J 2011;17:2. Ross EV. Optical treatments for acne. Dermatol Ther 2005;18:253-66. Taub AF. Procedural treatments for acne vulgaris. Dermatol Surg 2007;33:1005-26. Taylor MB. Summary of mandelic acid for the improvement of skin conditions. Cosmet Dermatol 1999;12:26-8. Sayed DS, Abdel-Motaleb AA. Salicylic acid versus lactic acid peeling in mild to moderate acne vulgaris. AAMJ 2012;10(Suppl 2):341-53. Bae BG, Park CO, Shin H, Lee SH, Lee YS, Lee SJ, et al. Salicylic acid peels versus Jessner's solution for acne vulgaris: A comparative study. Dermatol Surg 2013;39:248-53. Bari AU, Iqbal Z, Rahman SB. Tolerance and safety of superficial chemical peeling with salicylic acid in various facial dermatoses. Indian J Dermatol Venereol Leprol 2005;71:87-90. Kessler E, Flanagan K, Chia C, Rogers C, Glaser DA. Comparison of alpha- and beta-hydroxy acid chemical peels in the treatment of mild to moderately severe facial acne vulgaris. Dermatol Surg 2008;34:45-50.